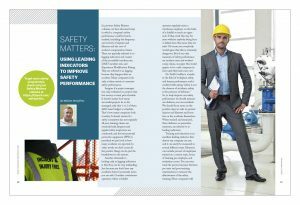 In previous Safety Matters columns, we have discussed ways in which a company’s safety performance could be benchmarked, including the frequency and severity of injuries and illnesses and the cost of workers’ compensation claims. These are typically referred to as lagging indicators and consist of the recordable incident rate, DART incident rate, and Experience Modification Rating. They are referred to as lagging because they happen after an accident. Many companies look only at these metrics to measure safety performance. Imagine if a project manager was only evaluated on projects that lost money or went past schedule. It doesn’t matter how many successful projects he or she managed, only that 1 or 2 of them didn’t meet budget or schedule. That’s how many companies look at safety. It doesn’t matter if a safety committee has met regularly all year, training classes are routinely held, frequent and regular safety inspections are conducted, and the best personal protective equipment (PPE) is provided; we just look at how many accidents are reported. In other words, we don’t count all the positive things we do, just the breakdowns in the system. Another downside to looking only at lagging indicators is that they can be very misleading. Just because you don’t have any accidents doesn’t necessarily mean you are safe. Consider a warehouse operation where a forklift operator regularly raises a warehouse employee on the forks of a forklift to reach an upper rack. If they work this way for years without anybody being hurt or killed, does this mean they are safe? Of course not; everybody would agree that this is extremely dangerous. But if our only measures of safety performance are incident rates and workers’ comp claims, on paper this would appear to be a safe company (at least until their luck runs out). So, to truly improve our safety performance we should measure our defenses, not our accidents. We should focus more on the positive steps we take to prevent injuries and illnesses and focus less on the accidents themselves. When tracked and measured, these defenses, or preventive measures, are referred to as leading indicators. Training and education is an excellent leading indicator that almost any company can use, and it can easily be measured in several different ways. Measures can include percent of employees trained on a certain topic, hours of training per employee, and evaluation scores. You can even track the percent increase between pre-tests and post-training examinations to measure the effectiveness of the safety training. Most companies will see a direct correlation between the amount and quality of training provided and increased safety and health performance. 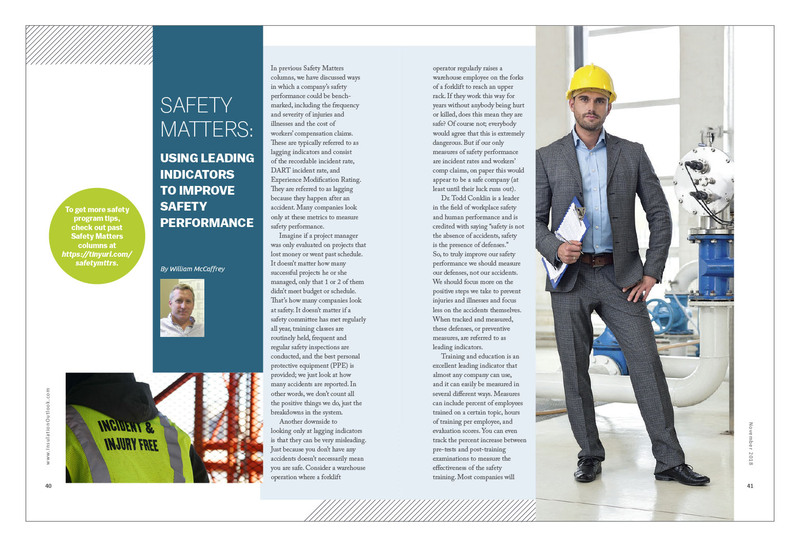 Safety inspections are another excellent leading indicator with broad applicability across all workplaces. The total number of inspections can be measured, or the percentage of inspections completed versus the number of inspections assigned. Even better is to measure the number of findings per safety inspection, both positive and negative findings. This shows the inspections aren’t just being pencil whipped. The number of corrective action items identified, and average days to close action items, are also very useful metrics. Some companies use a risk matrix when identifying hazards that factor in the likelihood and severity of a potential incident. This can be used to further breakdown inspection measures, including the number of high risk hazards, moderate risk hazards, etc. These are 2 great examples of leading indicators almost any company can use and are a good starting point for a company looking to begin tracking leading indicators. Risk assessments, near-miss reporting, disciplinary actions, and the preventive maintenance completion rate are a few more potential leading indicators companies can track and measure. Pick indicators appropriate for your operation that are specific and measurable. Leading indicators also have far superior predictive value over lagging indicators. They can be used to provide direction for health and safety improvements. This is especially true for companies that may be small and/or have relatively few incidents. It is hard to accurately identify trends from a small number of incidents. Take for example a company with only 2 recordable incidents in a year, one of which involved an employee tripping over a curb. The company may draw the conclusion that 50% of all recordable injuries are caused by employees tripping over curbs. They may then allocate resources to develop a curb safety policy, train all employees on how to safely step up on curbs, and launch an emphasis program to Stamp Out Curb Injuries. While this is a facetious example, it shows how only looking at lagging indicators may not be the best way to set your priorities. If the same company routinely tracked safety inspection findings and identified a trend of lockout/tag out violations, this is a much better predictor of future risk. The company can use this information to schedule training, add danger signs, or purchase additional lockout equipment. This proactive approach is a much better way to improve employee safety, rather than waiting until somebody gets seriously injured when a piece of equipment accidentally starts up.